A cooperative of goat breeders for the discussion and advancement of caprine research. 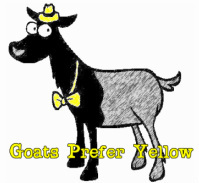 Did you know that Twin Willows goats prefer yellow? I have always wondered why my herd seemed to prefer to drink their water out of yellow buckets. I thought it might just be a coincidence until a fellow Nigi breeder mentioned that he also thought his herd liked to drink out of yellow buckets. This prompted me to conduct a scientific study within my own herd to find out if they actually do prefer to drink out of yellow buckets. I used five different colored buckets and rotated their position in the stall, weighing each newly filled bucket, and recorded the change in weight at the end of each data collection period. The results were startling! My goats preferred to drink water from the yellow bucket at a rate THREE TIMES the rate at which they drank from the next most popular colored bucket (which by the way was GREEN ) regardless of the position of the buckets in the stall. You may be asking yourself, "Who cares? Why does it matter which bucket your goats like to drink their water from?" The primary purpose of any dairy goat is to make milk. To make milk, the doe needs water. The more water they drink, the more milk they can make. Paired with good quality roughage and grain, the dairy doe will have all of the ingredients she needs to maximize her milk production. Although I have proven the yellow bucket hypothesis on my farm, there is still work to be done, and questions to be asked. * Can this study be duplicated on other farms with similar results? * Do other breeds of goats prefer to drink water from yellow buckets? * WHY do they prefer to drink from yellow buckets? My personal interest in research and my contact with other breeders who conduct small research studies on their own farms has prompted me to add a Think Tank forum to our website. There is much to be done in the areas of behavioral, nutritional, medical (particularly parasite management), and genetic caprine research. I have posted the procedural steps for data collection for the Yellow Bucket Study under the Behavioral Study forum. I will continue to build topics of interest within the research forums and introduce new research studies for discussion. Please feel free to develop new topics within the forums. I hope you will consider supporting and participating in this effort! See you on the forums!